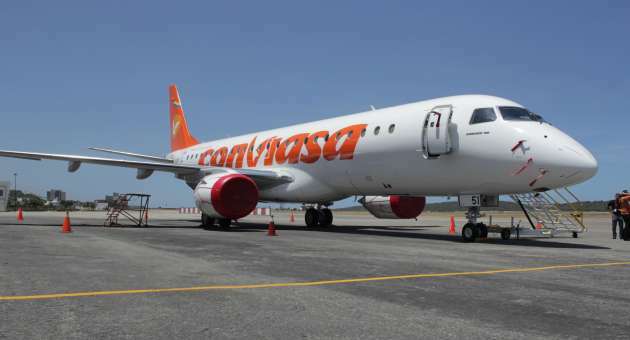 Venezuelan flag carrier Conviasa has started to recieve the first group of the twenty Embraer E-190 aircraft it bought in late 2011 to Brazil. The state airline, which was already in an urgent need of renewing its fleet and looking forward to getting back into Europe soon, is betting this investment will work for them as a relaunch. Sadly, other Venezuelan airlines can’t do the same and they keep on working with the oldest fleet in Latin America: 90% of the 108 planes used in our commercial aviation sector have 15 years or more of use (the average is 27 years). Less than half are functional. Last month, the head of the Venezuelan Civil Aviation Insitute (INAC) hinted that the solution to this problem is reducing the number of domestic flights and routes. Given the high demand and the limited alternatives for travel, this could make things much worse. Long ago, Barquismeto Airport served the entire country and had its share of international flights to boot. Now, there’s only one main domestic destination: Maiquetia. I see the reason behind that everyday, with the coming and going of the same model of airliner in the sky. Maybe the Chavernment could ask Iberia about those planes they’re about to retire.